I moved from Utah to Minnesota at the beginning of May and was missing my sisters quite a bit so I started to plan a trip with my boyfriend. We left Thursday afternoon and arrived about 1000 miles away to visit with one of my sisters Friday evening. Friday my sister, her son, my boyfriend, and I got into my sister's car and drove to see my other sister in Utah. It is so good to be with family. 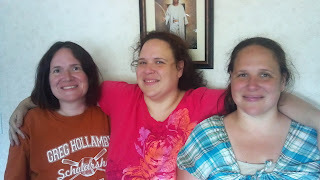 My sisters are my best friends and it is good to be with them for a short period of time again. I will head home Wednesday. I know after this visit I will have motivation to get things done on the boat and to continue on with other plans, but I am so thankful for some sister time for the next few days. What are some of the plans you have for summer? What was the last spontaneous thing you did? I am happy that my boyfriend agreed to this plan and hope he is having some fun visiting too!